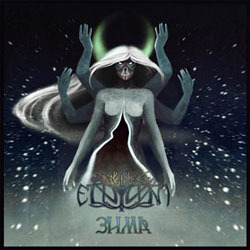 Russian folk metallers Eldiarn from Moscow will release their new EP “Зима / Winter” on the 26th of December 2014. It will be available digitally at first, posted on their official VK page, but it will also appear on physical media EP in mid-January 2015. Eldiarn were formed in 2011 and self-released their debut full-length album “Кабаньей Tропой / Along the Wild Boar’s Trail” in 2013. The upcoming EP will include 7 new songs. Apart from the album tracklist and the cover artwork painted by Evgenia Bazarova, Eldiarn have also revealed the title track of “Зима” that you can listen in their official page, following the link below.